Shirley Smith was one of the most remarkable New Zealanders of the 20th century, a woman whose lifelong commitment to social justice, legal reform, gender equality and community service left a profound legacy. She was born in Wellington in1916. While her childhood was clouded by loss - her mother died when she was three months old and her beloved father, lawyer and later Supreme Court Judge David Smith, served overseas during the war - she had a privileged upbringing. She studied classics at Oxford University, where she threw herself into social, cultural and political activities. Despite contracting TB and spending months in a Swiss clinic, she graduated with a good Second and an intellectual and moral education that would guide her through the rest of her life. She returned to New Zealand when war broke out, and taught classics at Victoria and Auckland University Colleges, before marrying eminent economist and public servant Dr W.B. Sutch in 1944, and giving birth to a daughter in 1945. She kept her surname - unusual at the time - and poured her energy into issues of human rights and social causes. She qualified as a lawyer at the age of 40, and in her career of 40 years broke down many barriers, her relationship with the Mongrel Mob epitomising her role as a champion of the marginalised and vulnerable. In 1974, Bill Sutch was arrested and charged with espionage. After a sensational trial he was acquitted by a jury, but the question of his guilt has never been settled in the court of public opinion. Shirley had reached her own political turning point in 1956, with Khrushchev's revelations about Stalin and the Hungarian crisis, but she remained loyal to her husband, and the ongoing controversy weighed heavily on her later years. 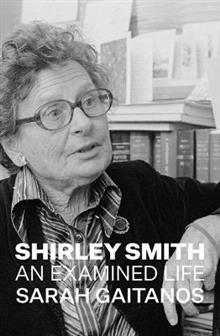 Shirley Smith: An Examined Life tells the story of a remarkably warm and generous woman, one with a rare gift for frankness, an implacable sense of principle, and a personality of complexity and formidable energy. Her life was shaped by some of the most turbulent currents of the 20th century, and she in turn helped shape her country for the better. Sarah Gaitanos is the author of The Violinist: Clare Galambos Winter, Holocaust Survivor; Nola Millar: A Theatrical Life; and with Alan Bollard, Governor of the Reserve Bank of New Zealand, the bestseller Crisis: One Central Bank Governor and the Global Financial Collapse. Sarah is an independent writer, researcher and oral historian.